Most New Jersey residents only think of a forest fire as something that exists on TV. The reality is, New Jersey’s pine barren forests are one of the most fire prone environments. With all eyes on fire activity in the West and Alaska, New Jersey has still experienced 728 fires with 1484.5 acres burned as of August 23rd, 2015. It is important for homeowners to understand the risk despite the perceived danger. o New Jersey’s Department of Environmental Protection recommends 100 feet between a home and the forest. 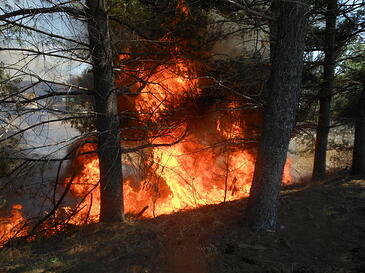 Trees in the yard also pose a risk of igniting from flying embers. o Anything flammable that is up against or attached to a home can help carry a flame directly to the house. o Much like decks, wooden roofs and siding can easily ignite. Flying embers can find their way into crevasses and smolder for hours before becoming noticeable. o House numbers that are easily seen from the road and at night are a simple addition and can be helpful in all emergency situations. Obviously, some of these dangers are either impossible to avoid or extremely expensive to fix. It is not necessary to put up a new roof or chop down your favorite tree. Simple things like maintaining the yard, making the house number visible, and keeping patio furniture in a position where it could easily be put indoors makes a big difference without costing much. o Some towns do not have water provided for hydrants. Firefighters must then rely on the water they can transport. o In the event of any fire, fuel tanks and containers pose a risk to the house and emergency personnel. o In an area without working hydrants, a pump could be used at a body of water to help combat the flames. o Downed power lines are a danger in any situation, and every wire should be considered to be charged. o Fire runs uphill. A home on a steep hill can be overtaken much faster than on flat land. o A home with a turnaround makes for better access for emergency vehicles. o A two-lane paved road provides even more access to a home. When it comes to environmental emergencies in northern NJ, forest fires are not an extreme danger. However, the little steps that would improve a home’s protection can carry over to other emergency situations as well. In all situations, proper planning and risk mitigation help prepare for the unknown future.